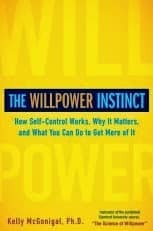 The author talks about the science behind willpower and explains that it is an instinct very much like the “fight or flight” instinct that keeps us alive when spotting a tiger. But, like a muscle, we can increase the strength of our willpower with practice. Unfortunately, there are corporations out there who stand to profit by our lack of willpower! McGonigal cites studies that show how retailers use their knowledge of psychology to get us to buy more. For example, people buy more things in stores where Christmas music is playing. One retailer got people to come to his ice cream shop in the basement of a building by cranking out the artificial aroma of waffle cones so people could smell it upstairs. Simply knowing things like this can help us to resist impulse buys. She also talks about things that don’t work — feeling guilty and beating ourselves up actually makes people do more of whatever they feel guilty about. For example, there is evidence that health warnings on products, such as cigarettes, actually cause people to use them more. McGonigal has found an ideal blend of sharing scientific research with practical tips on how to increase your willpower, whether you want to lose weight, stop smoking, or spend less money. I highly recommend this book for anyone who has a goal for the new year. I purchased this as an audiobook from Audible, so I could listen to it on my smartphone, although it is also available as a hardcover book, paperback, and ebook, so you can read or listen in whatever form works for you.